In 1976, Bill Gates sent an open letter to members of the Homegrown Computer Club, in which he opined hackers unfairly copied his software, and undermined his labor and right to profit from intellectual property. At the time, most software was distributed in computer clubs like Homegrown. The letter represents an early manifestation of the growing tensions between the Hacker Ethic and those who wished to police or stymie software hackers. As micro-computing spread across the country in the late 1970s and 1980s, new people purchased computers--people uninterested in hacking software, hardware, or joining computer clubs. As tech journalist Steven Levy declared, "these pioneering computer owners in the early eighties might learn enough about their machines to appreciate the beauty of an unencumbered flow of information, but the Hacker Ethic, microcomputer-style, no longer necessarily implied that information was free. These new owners patronized their local computer stores, or purchased products advertised in computer magazines, like Softalk, from one of the burgeoning software companies across the country. The first volume of Softalk was published in September of 1981. By the December issue, there were over 100 advertisements. For a time, the micro-computer software industry was a gold-rush, and young entrepreneurs profited millions. However, from mid-1983 to 1985, the software bubble burst, and "shake out" bankrupted much of the industry. The shakeout was a result, at least in part, to a bloated market, having too much poorly designed, error-ridden, and repetitive software programs that copied the look and feel of other software. It is unclear how or whether piracy contributed to the fallout. 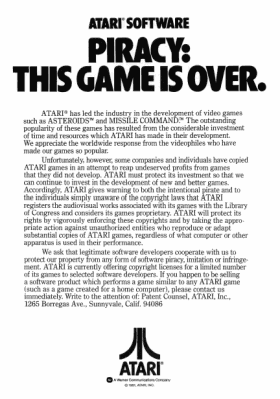 However, some software companies themselves pirated from other game makers, such as ATARI, who issued their own open letter to entrepreneurial pirates. While Softalk hackers often defended piracy as a means to correct these issues, others marked piracy acts as nothing more than theft. Softalk letters-to-the-editor are historic artifacts, and offer glimpses into early computing culture. The letters below are from readers who advocate for piracy policing and appear in Softalk's "Open Discussion" section from 1980 to 1984. In these letters, hackers or pirates are condemned as thieves, stealing from manufactures and violating law. Carlston, D. G. (1985). Software People: An Insider's Look at the Personal Computer Software Industry. Simon & Schuster. Levy, Steven. 2010. Hackers: Heroes of the Computer Revolution. Sebastopol, CA: O'Reilly Media Inc.